We are a couple weeks away from your reigning Pac-12 Champion USC Trojans return to the Memorial Coliseum. 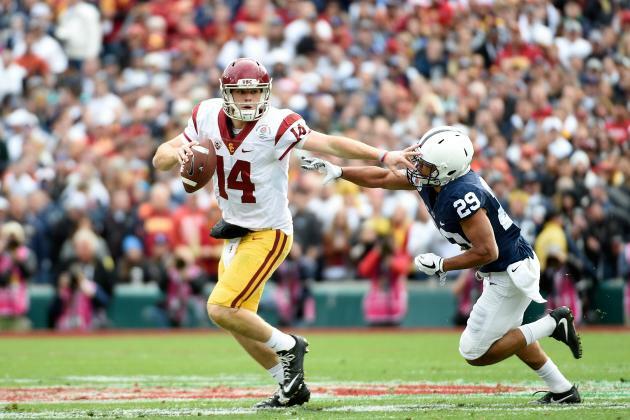 USC’s brings back a young and talented offense and a stout veteran defense. The biggest question on offense is who will replace Sam Darnold. Redshirt sophomore Matt Fink has the most experience, but redshirt freshman Jack Sears and true freshman JT Daniels have displayed the raw talent required of USC’s starting quarterback. Whoever head coach Clay Helton names as the starter, he will have an arsenal of talented skill position players to support him. Tyler Vaughns and Michael Pittman Jr. lead a deep receiving corps, while Aca’Cedric Ware and Stephen Carr bring speed and power to the running game. USC also returns four starters on the offensive line, which should help the new quarterback settle in. The defense, led by linebackers Cameron Smith and Porter Gustin, is also loaded and looking to continue making progress in the third year in defensive coordinator Clancy Pendergast’s system. The Trojans brought in another top-ranked recruiting class in 2018, and several freshmen, including the aforementioned JT Daniels ang Amon-Ra St. Brown, will be key to the Trojans’ success. Yet again, USC has one of the most challenging schedules in the nation, including consecutive September road games against Stanford and Texas. The Trojans home schedule includes another Friday night matchup with Washington State and concludes with hated rival Notre Dame. On Saturday, September 1st, the TKE Tent will be returning to EXPO Grass East (right in front of the Rose Garden), only steps away from the EXPO Park/USC Metro line stop. We’re providing the same great experience you’ve come to expect: craft beer, great food, and fun for you and all of your friends and family. One major update to this year’s experience: we will be staying open through the first half. So if you want to avoid the rush of getting into the Coliseum or don’t want to deal with the line at Traddie’s, we’ll have you covered. Whether you are coming to one game, the whole season, or anything in between, we having a pricing plan that will work for you. Check out all of your options at www.TKEtent.com. If you didn’t attend a TKE Tent last season, or maybe it has been even longer, we’d love to have you back. Grab your friends, family, and leave all the tailgating supplies at home. We look forward to seeing you at the TKE Tent on Saturday, September 1st, or at another game this season. Stay informed about games, times and what’s on tap. 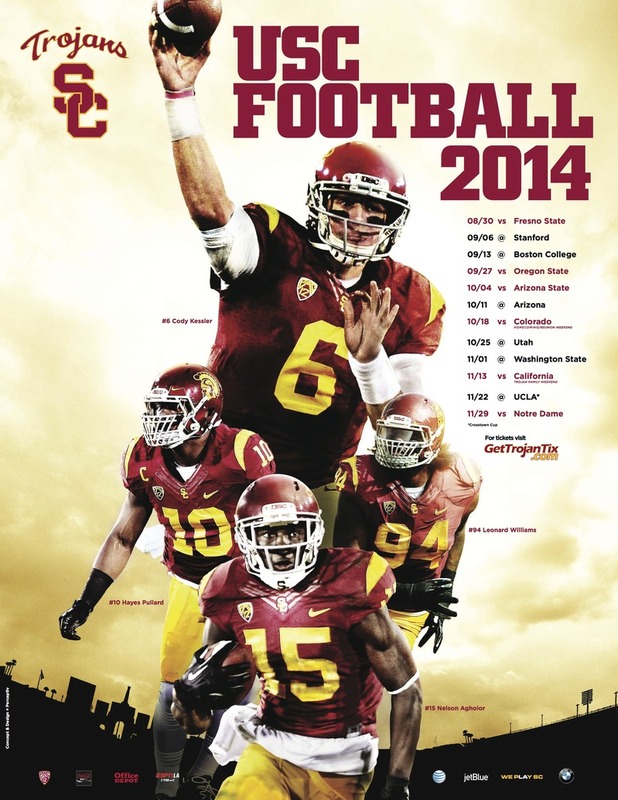 We are a couple weeks away from your reigning Rose Bowl Champion USC Trojans return to the Memorial Coliseum. USC’s offense brings back Heisman hopeful quarterback Sam Darnold, electrifying running back Ronald Jones II, and a slew of talented young wide receivers. The defense, led by linebackers Cameron Smith and Porter Gustin, are also loaded and looking to make waves in the Pac-12. The Trojans brought in another top-ranked recruiting class in 2017, and several freshmen will likely have a prominent role on this year’s team. Yet again, the Trojans have one of the most challenging schedules in the nation, including a Western Michigan team that went 13-1 and played Wisconsin in the Cotton Bowl and a reloaded Texas team, now coached by Tom Herman. The Trojans avoid regular season matchups with Washington and Oregon but will have tough road tests against Washington State, Notre Dame, and Colorado. On Saturday, September 2nd, the TKE Tent will be returning to EXPO Grass East (right in front of the Rose Garden), only steps away from the EXPO Park/USC Metro line stop. We’re providing the same great experience you’ve come to expect: craft beer, great food, and fun for you and all of your friends and family. Don’t wait… sign up today at www.TKEtent.com and you’ll bypass the line at your first game. If you didn’t attend a TKE Tent last season, or maybe it has been even longer, we’d love to have you back. Grab your friends, family, and leave all the tailgating supplies at home. We look forward to seeing you at the TKE Tent on Saturday, September 2nd, or at another game this season. We are less than a month away from your reigning Pac-12 South Champion USC Trojans return to the Memorial Coliseum. USC’s offense brings back a pair of 900-yard runners, its top 5 pass catchers, and the entire offensive line from a year ago. The Trojans will have 80 scholarship players, including another top-ranked recruiting class, making this year’s team the deepest team of the decade. Everyone will have to pull their weight as the Trojans have one of the most challenging schedules in the nation, featuring 11 teams that played in 2015 bowls (including 3 in New Year’s Six bowls) and 5 that were in the final AP Top 25 poll. The road will be tough in 2016 but the victory will be sweet. On Saturday, September 10 the TKE Tent will be returning to EXPO Grass East (right in front of the Rose Garden), only steps away from the EXPO Park/USC Metro line stop. We’re upping our game with more craft beer, better food (including the much anticipated return of the IN-N-OUT truck), and more fun for you and all of your friends and family. Don’t wait… sign up today at www.TKEtent.com and you’ll bypass the line at your first game. Whether you are coming to one game, the whole season, or anything in-between, we having a pricing plan that will work for you. Check out all of your options at www.TKEtent.com. If you didn’t attend a TKE Tent last season, or maybe it has been even longer, we’d love to have you back. Grab your friends, family, and leave all the tailgating supplies at home. We look forward to seeing you at the TKE Tent on Saturday, September 10 or at another game this season. Your USC Trojans return to the gridiron on Saturday, September 5 with a Pac-12 Championship and a College Football Playoff birth in their sights. We have a lot to be excited about: #1ranked recruiting class in the nation, 19 players on the major award watch list, and an extra home game to watch it all come together. 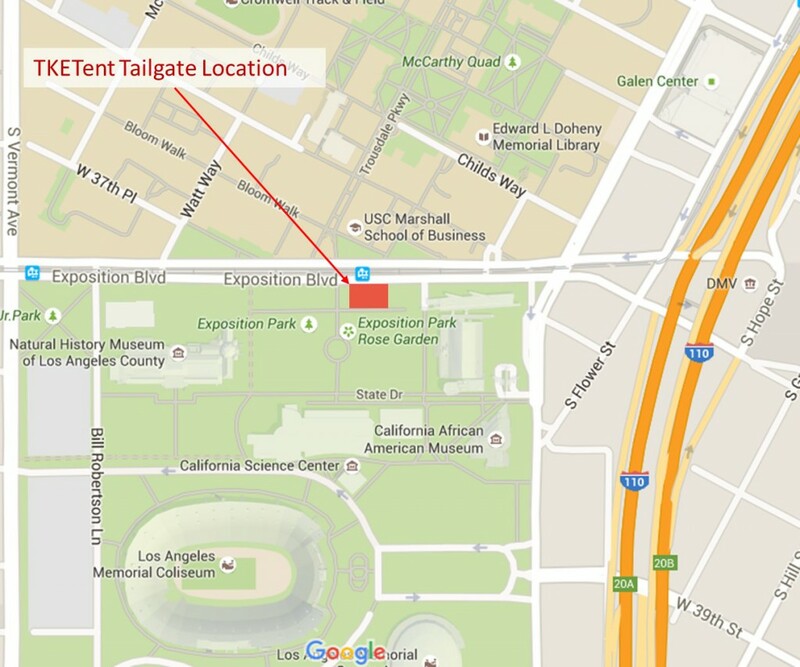 The TKE Tent will be returning to EXPO Grass East (right in front of the Rose Garden), only steps away from the EXPO Park/USC Metro line stop. We’re upping our game with more craft beer, more food trucks (including IN-N-OUT), and more fun for you and all of your friends and family. 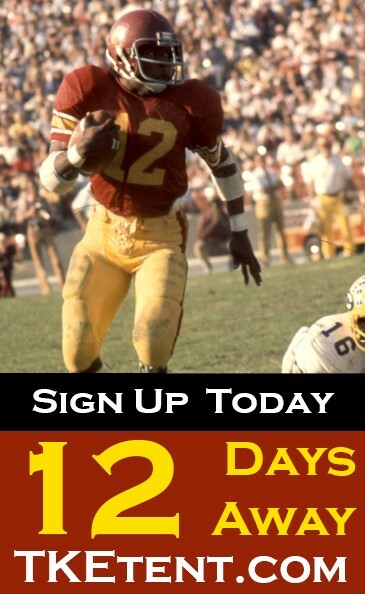 Don’t wait… sign up today at www.TKEtent.com and you’ll bypass the line at your first game. If you didn’t attend a TKE Tent last season, or maybe it has been even longer, we’d love to have you back. Grab your friends, family, and leave all the tailgating supplies at home. We look forward to seeing you at the TKE Tent on Saturday, September 5 at 4:30 p.m. or at another game this season.